So I know that I don't usually post on Thursdays, but considering school was canceled today because of inclement weather, I thought why not. So today I have Product (Red) 1hund(red) artist # 94 Andrew Mania's design. This shoe is currently available at Converse.com in a White/Navy colorway. For those of you that grew up going to Sunday School, these shoes might remind you of a felt board you were taught with. 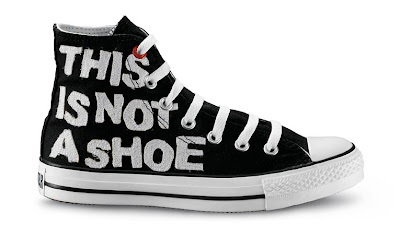 At least the words on the chucks look like Felt to me. If you have no idea what I am talking about or just wish for a trip down memory lane check out this website. 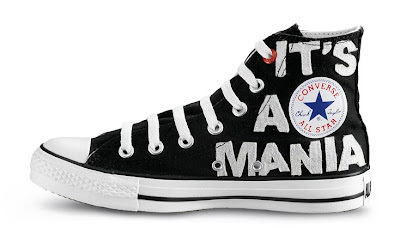 Well that's it for today, check back sometime tomorrow for The Converse Blog's Friday Flashback! very cool... and for a good cause too! !